Managed Healthcare Pharmacy is committed to protecting the privacy of your personal and medical information. We are required by applicable federal and state laws to protect the privacy of your personal and medical information. Personal and medical information means any information regarding your health care and treatment: identifiable factors including your name, age, address, and financial information. Medical information may be about health care we provided to you or payment for health care provided to you. It may also be information about your past, present of future medical condition. 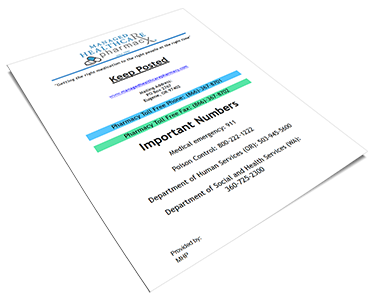 · Have copies of the new Notice available upon request. Please contact our Privacy Officer at (866) 367-8701. If, at any time, you have questions about information in this Notice or about our privacy policies, procedures or practices, you can contact our Privacy Officer at (866) 367-8701. We use and disclose medical information about patients every day. This section of our Notice explains in some detail how we may use and disclose medical information about you in order to provide healthcare, obtain payment for that healthcare, and operate our business efficiently. This section briefly mentions several other circumstances in which we may use or disclose medical information about you. For more information about any of these uses or disclosures, or about any of our privacy policies, procedures or practices, contact our Privacy Officer at (866) 367-8701. We may use and disclose medical information about you to obtain payment for healthcare services that you received. This means that, within the pharmacy, we may use medical information about you to arrange for payment (such as preparing bills and managing accounts). We may also disclose medical information about you to others (such as insurers, collection agencies, and consumer reporting agencies). In some instances, we may disclose medical information about you to an insurance plan before you receive certain healthcare services; for example, we may need to know whether the insurance plan will pay for a particular service. Cooperating with outside organizations that evaluate, certify or license healthcare providers, or staff of facilities in a particular field or specialty. Reviewing and improving the quality, efficiency, and cost of care that we provide to you and our other patients. Improving healthcare and lowering costs for groups of people who have similar health problems, and helping manage and coordinate the care for these groups of people. Cooperating with outside organizations that assess the quality of the care we provide, and others including government agencies and private organizations. Planning for our organizations future operations. We may disclose medical information about you to a relative, a close personal friend, or any other person you identify if that person is involved in your care and the information is relevant to your care. If the patient is a minor, we may disclose medical information about the minor to a parent, guardian or other person responsible for the minor except in limited circumstances. For more information on the privacy of minors’ information, contact our Privacy Officer at (866)-367-8701. We may also use or disclose medical information about you to a relative, another person involved in your care or possibly a disaster relief organization if we need to notify someone about your location or condition. You may ask us at any time not to disclose medical information about you to persons involved in your care. We will agree to your request and not disclose the information except in certain limited circumstances (such as emergencies) or if the patient is a minor. If the patient is a minor, we may or may not be able to agree to your request. When permitted by law, we may use or disclose medical information about you without your permission for various activities that are recognized as “national priorities.” In other words, the government has determined that under certain circumstances (described below), it is so important to disclose medical information that it is acceptable to disclose medical information without the individual’s permission. We will only disclose medical information about you in the following circumstances when we are permitted to do so by law. Below are brief descriptions of the “national priority” activities recognized by law. For more information on these types of disclosures, contact our Privacy Officer at (866) 367-8701. Public Health Activities: We may use ore disclose medical information about you for public health activities. Public health activities require the use of medical information for various activities, including, but not limited to, activities related to investigating diseases, reporting child abuse and neglect, monitoring drugs or devices regulated by the FDA, and monitoring work-related illnesses or injuries. For example, if you have been exposed to a communicable disease (such as a sexually transmitted disease), we may report it to the State and take other actions to prevent the spread of the disease. Health Oversight Activities: We may disclose medical information about you to a health oversight agency. For example, a government agency may request information from us while they are investigating possible insurance fraud. Court Proceedings: We may disclose medical information about you to a officer of the court (such as an attorney). For example, we would disclose medical information about you to a court if a judge orders us to do so. Research Organizations: We may use or disclose medical information about you to research organizations if the organization has satisfied certain conditions about protecting the privacy of the medical information. Other than the uses and disclosures described above (#1-6), we will not use or disclose medical information about you without the “authorization” or signed permission of you or your personal representative. In some instances, we may wish to use or disclose medical information about you and we may contact you to ask you to sign an authorization form. In other instances, you may contact us to ask us to disclose medical information and we will ask you to sign an authorization form. If you believe that your privacy rights have been violated or if you are dissatisfied with our privacy practice you may contact us by using the information listed below. You can file a complaint with the U.S. Department of Health and Human Services Office for Civil Rights by sending a letter to 200 Independence Avenue, S.W., Washington, D.C. 20201. Or by visiting www.hhs.gov/ocr/privacy/hipaa/complaints.